It is our pleasure to assist you. Kindly, notify us by filling out this form. We provide warranty services according to the manufacturer's warranty. 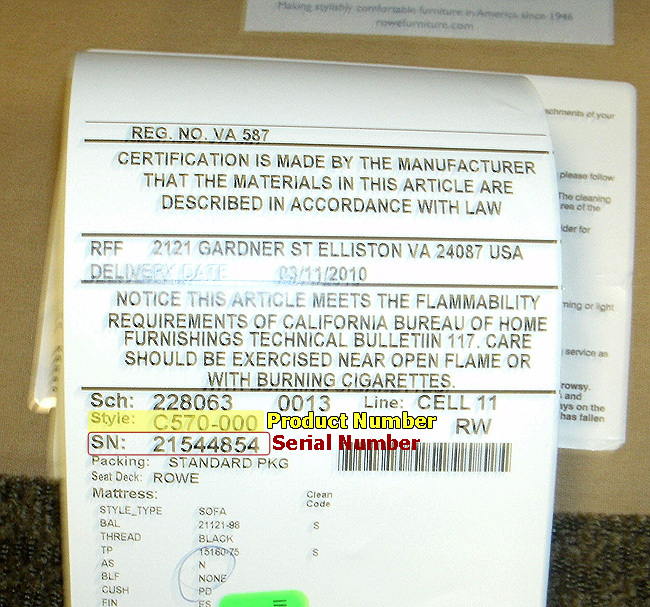 The manufacturers require us to follow procedures that they allow under their warranty. Manufacturers labor warranty provides coverage for the labor to repair the item. This does not include transportation. There is a standard charge for transportation to and from our Service Center or back to the manufacturer. Our Customer Service Coordinator will be happy to review these charges with you if applicable. As-Is items are not covered by warranty. For any fabric wear or cleaning issue that had stain treatment or leather treatment applied please call: 800-866-9636 within 5 days of the issue. This will allow you to take advantage of the extended warranty provided by the treatment manufacturer. Follow all instructions on the warranty card you received. It is your responsibility to provide us with your purchase invoice, transportation, and emailed pictures. Our office will be happy to assist when we can, however, due to the high volume, older invoice information is purged from our computer system. 1. La-Z-Boy - Found under the footrest, cushion, or stapled to the bottom of the unit. 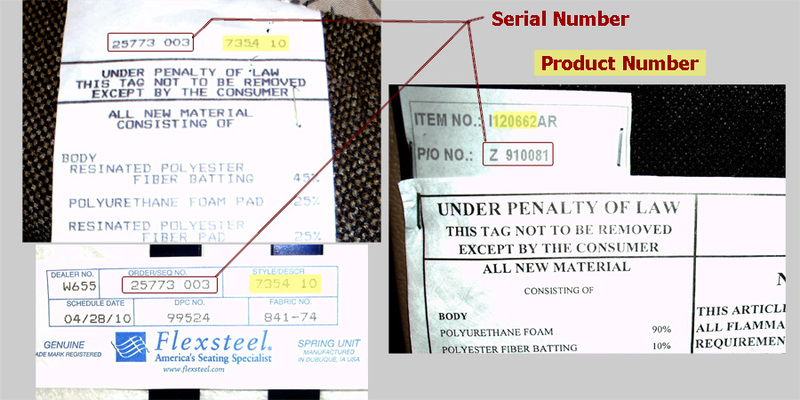 This tag will have both the Product Number (style and fabric numbers) and the Serial Number (referred to as ACK/Line/Item Number). 2. Flexsteel - Found under the footrest, cushion, or attached to the bottom of the unit. This tag will have both the Product Number (style and fabric numbers) and the Serial Number. 3. Lane - Found under the footrest, cushion, or stapled to the bottom of the unit. 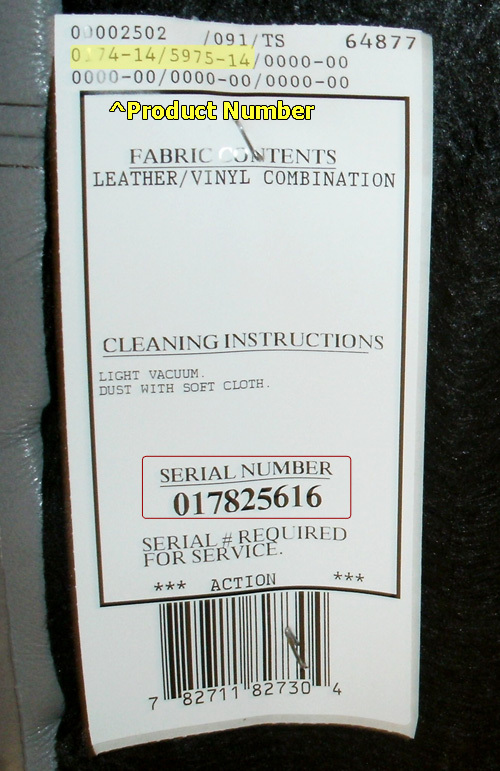 This tag will have both the Product Number (style and fabric numbers) and the Serial Number. 4. Rowe - Found under the footrest, cushion, or stapled to the bottom of the unit. 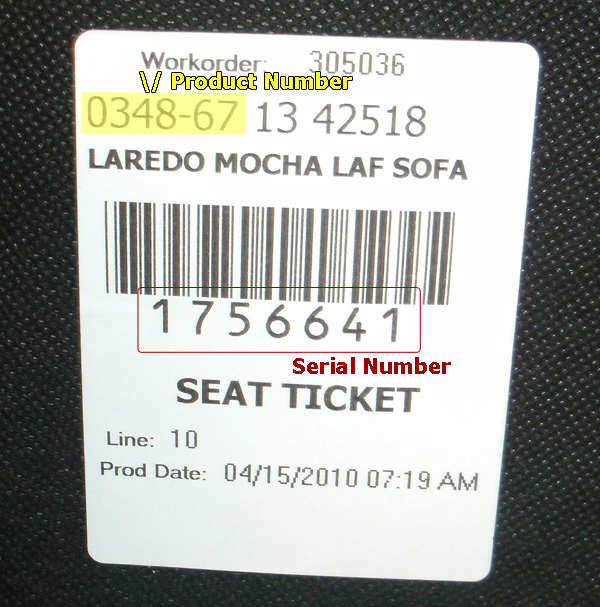 This tag will have both the Product Number (style and fabric numbers) and the Serial Number. 5. Albany - Found under the footrest, cushion, or on the bottom of the unit. 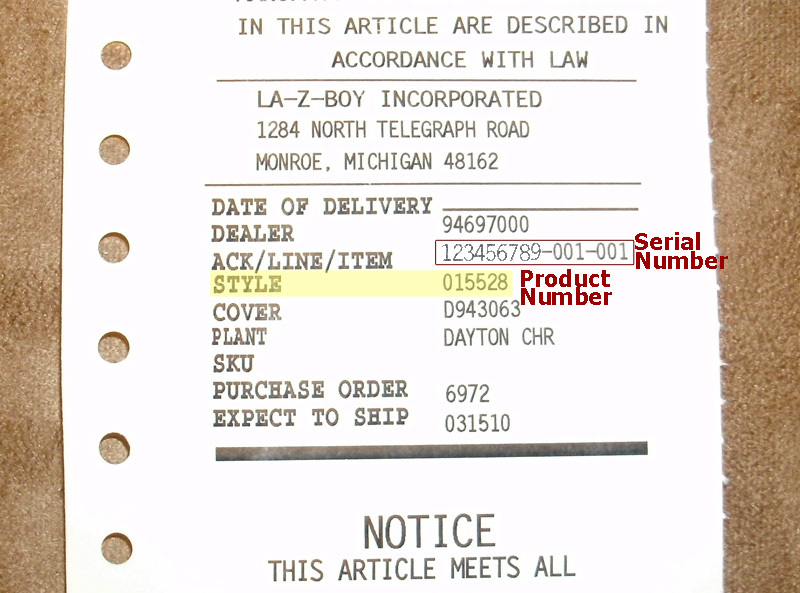 This tag will have both the Product Number and the Serial Number. 6. Spring Air - Found on the hang tag at the head of foot end of the mattress. 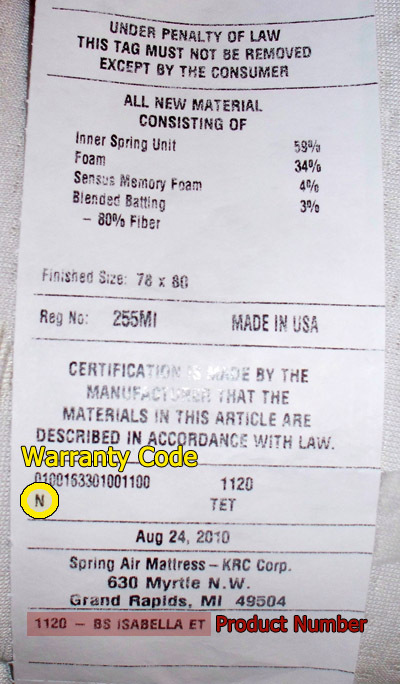 This tag will have the warranty code. Please allow 30 to 40 days for any part orders since these orders are made after the factory receives the order. Our Customer Service Coordinator will be contacting you to process your request and go over any applicable charges or estimates of charges. Thank you for allowing us to serve you.